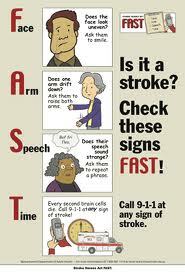 May is National Stroke Awareness month. As a certified geriatric care manager, I maintain that it is a good time to review not just the warning signs of stroke, but also what you should do if you are a caregiver to a loved one who may be susceptible to a stroke. You may have heard of the acronym we often use to make it easy to remember what to look for as possible sign and symptoms of stroke: F-A-S-T.
F-Face: Strokes can manifest themselves in a slight droop on one side of the face, and a clear way to test for the possibility of stroke s to ask your loved one to small. If you notice one side of the face does not match the other side you may be seeing the immediate aftermath of a stroke. A-Arms: Ask your loved one to raise both arms above their head. If they have had a stroke, one arm may tend to drift away from being straight up or they may be unable to lift one side. S-Speech: Ask your loved one to say a short sentence and listen for any slurring of words. Try something like: “No ifs, ands or buts.” They may also manifest the stroke with inability to retrieve the right words to describe how they feel, their surroundings or something else. T-Time: Time works against the stroke victim, so it is essential to act quickly by call 9-1-1 and get help as soon as possible. Especially if the cause of the stroke is a clot (versus a hemorrhage) it is critical to get them to a hospital for examination and possible intervention using new medicines for breaking up a clot within three hours of the stroke event. The symptoms of stroke are not slow to develop which should make it easier to spot them. If your loved one comments on a sudden numbness or weakness in any of their limbs or on the side of their face, try the FAST test and call 9-1-1. If they are having difficulty speaking or appear suddenly confused, test them and then make the call. 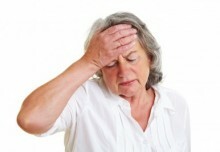 If your loved one has blurry vision, is suddenly clumsy, dizzy or has a severe headache, remember FAST. In all of these potential scenarios, you will see a general pattern. The symptoms come on suddenly, and they are most often asymmetrical, affecting one side or the other depending on which side of the brain is manifesting the stroke. And your FAST response as a caregiver can make all the difference in how severe the stroke will be and how fully your loved one may recover. Charlotte Bishop is a certified Geriatric Care Manager and founder of Creative Case Management, certified professionals who are geriatric care managers, resources, counselors and friends to older adults and their families in metropolitan Chicago. Please email your questions to ccbishop@creativecasemanagement.com. Thanks for sharing this information. I am really searching for insights and information regarding stroke since my dad is hypertensive and I wanted to be aware for the signs that I should look out for. Stroke is a condition that needs an early treatment in order for a person to survive and for its condition not to worsen.